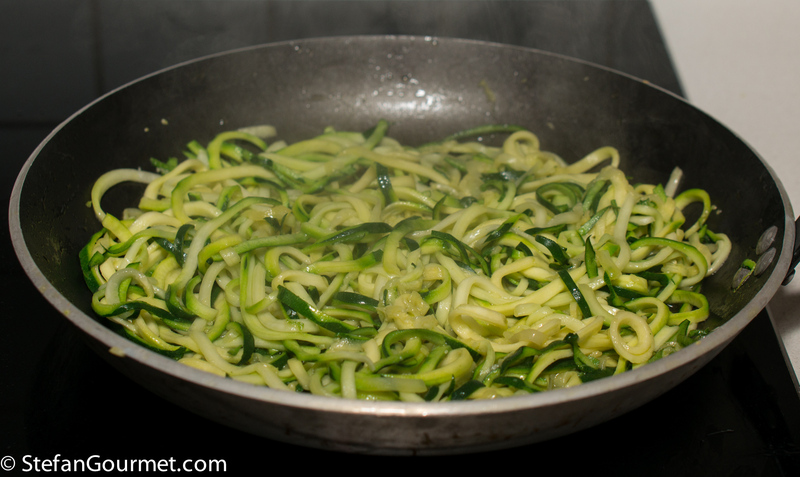 Zoodles are noodles made from zucchini. You make them with a gadget called a spiralizer. There are electric ones as well has hand-operated models. I got one of the latter after reading ChgoJohn’s blog post about the spiralizer he had gifted himself. (He knows what I want him to get next…) I don’t consider zoodles an actual substitute for real pasta, but they sure are a nice way to prepare a lighter meal. Using the hand-operated spiralizer is very easy, so there is no need for an electric version. 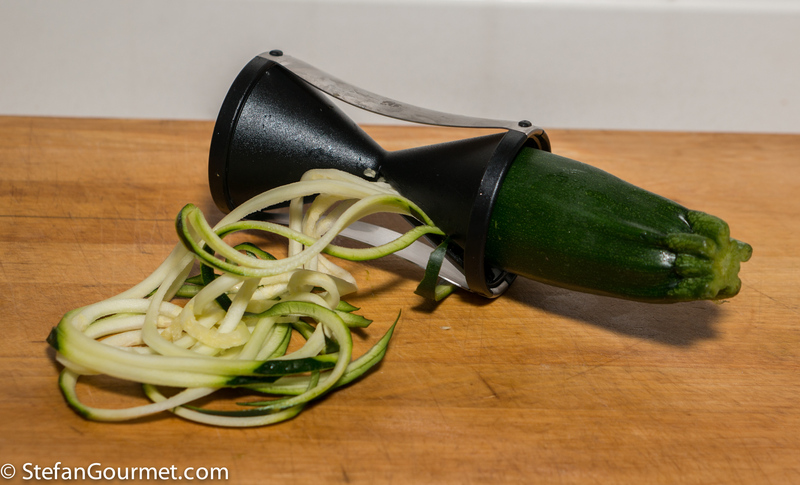 You just insert the zucchini and turn it around; for the final part a tool is provided to handle the zucchini without cutting your fingers (not shown in the photo). 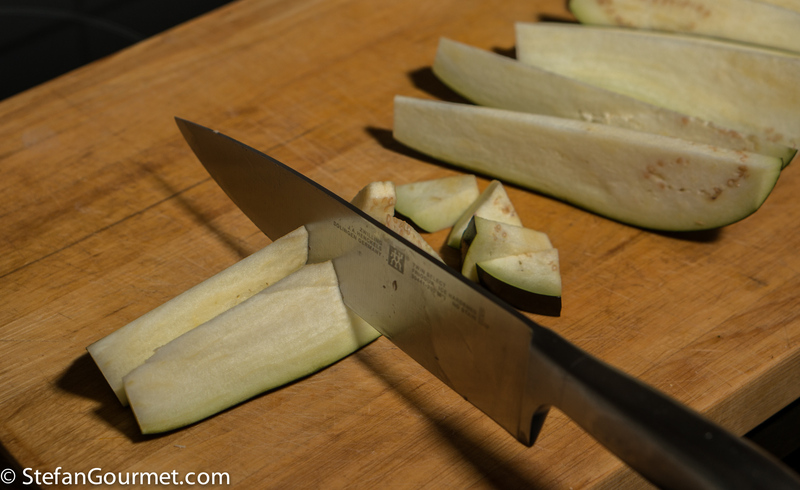 Cut both ends off the eggplant, then cut it in 8 wedges lengthwise and cut each wedge into 1 cm (1/2 inch) slices. This way, each piece of eggplant will have some skin. 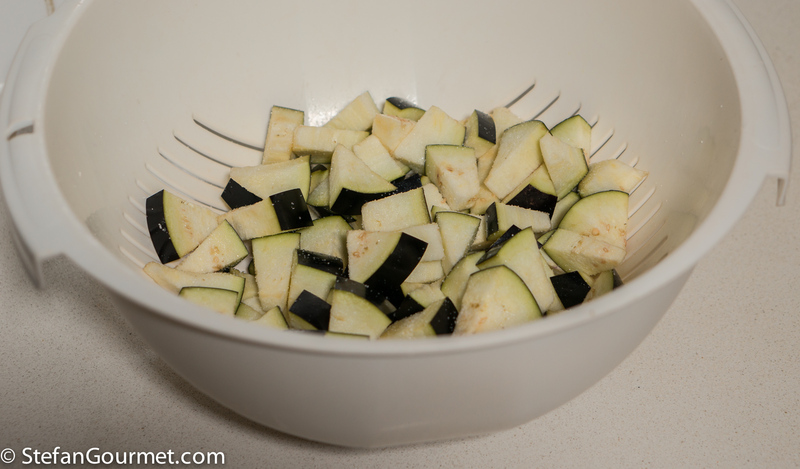 Put the eggplant pieces in a colander and season with salt and let them sit for about half an hour. 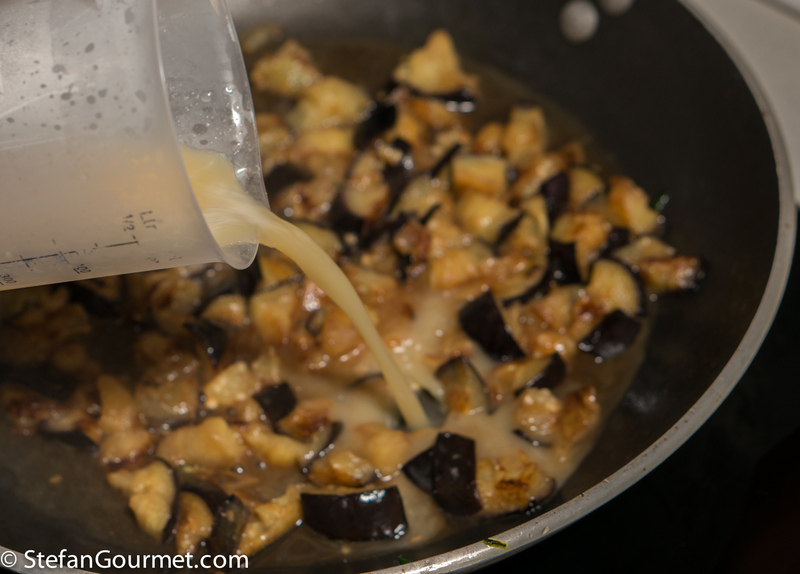 The salt will draw out some juices and that will improve the texture and flavor of the eggplant. 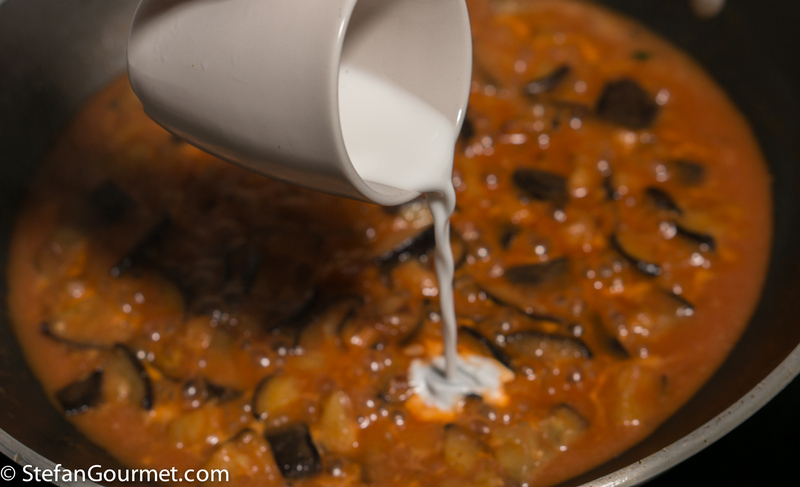 After that half hour, rinse the eggplant under cold running water to remove any excess salt. Then dry the eggplant with paper towels. Remove the skin from the fish fillets. Cut the fish into bite-size pieces, and season with salt. Seasoning the fish early will allow the salt to penetrate into the fish and season it throughout, as well as firm up the fish a little so it will keep its shape better. The picture shows what end to cut off. 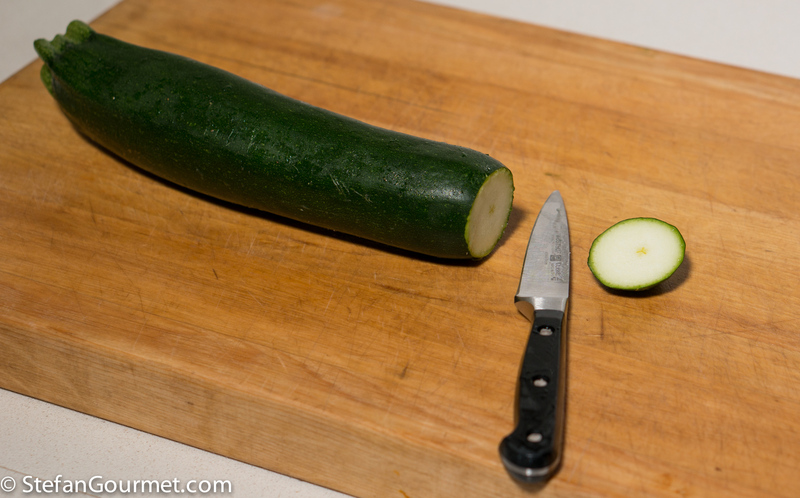 Cut the end off a zucchini. 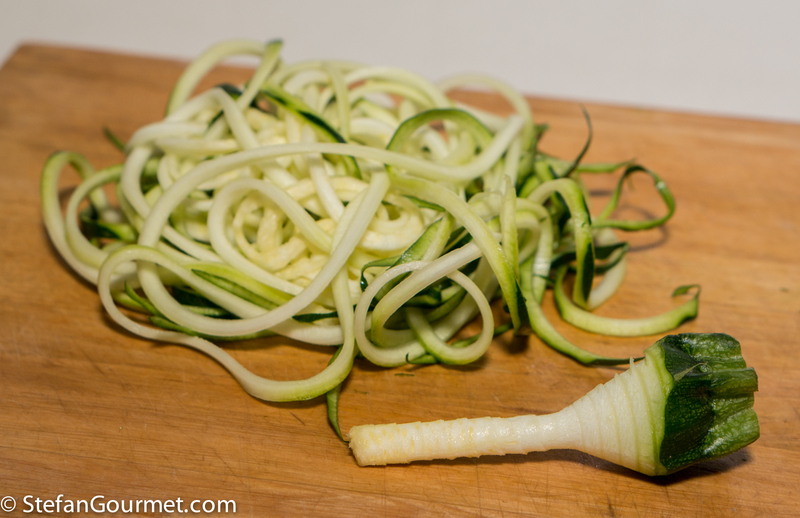 Use the spiralizer to turn the zucchini into zoodles. There is relatively little waste. Use the waste for making the fish stock. 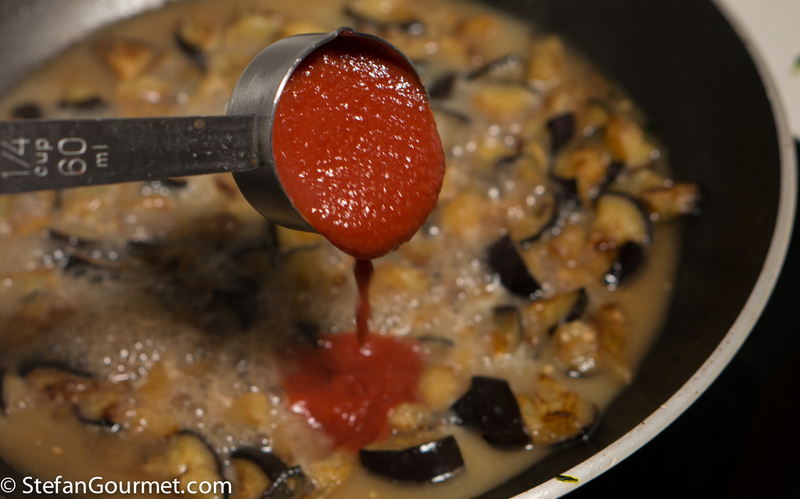 Heat 2 tablespoons of olive oil in a frying pan and add the eggplant. 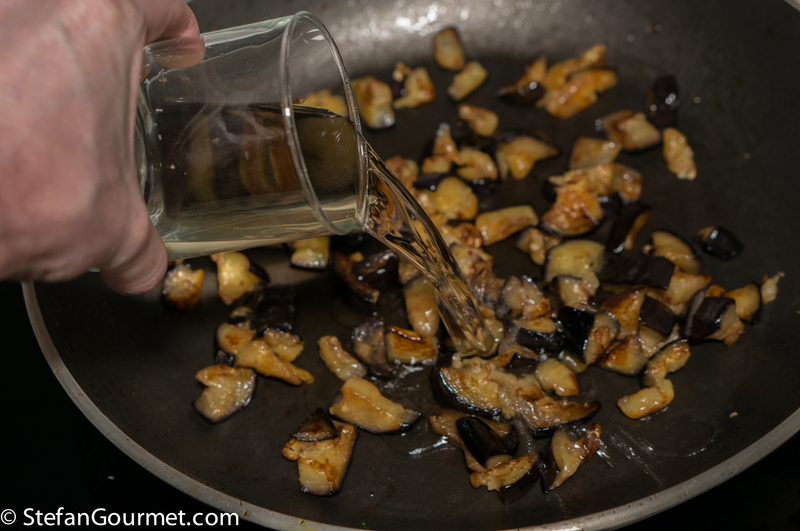 Stir until the eggplant is coated with olive oil. 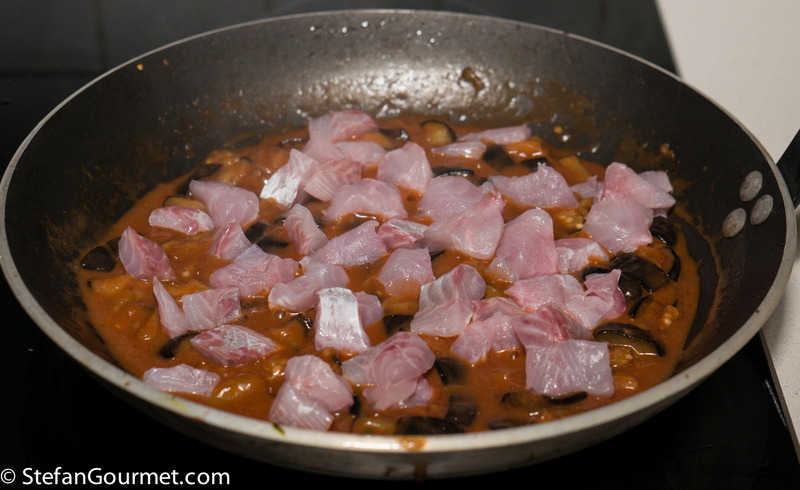 Then cover the pan and cook the eggplant over medium-high heat, stirring regularly. 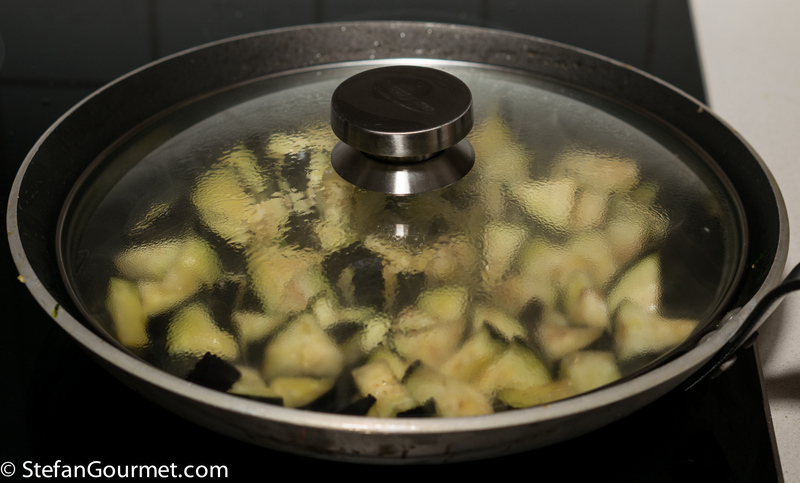 The cover will help to speed up the cooking process, as the eggplant will be partly steamed. 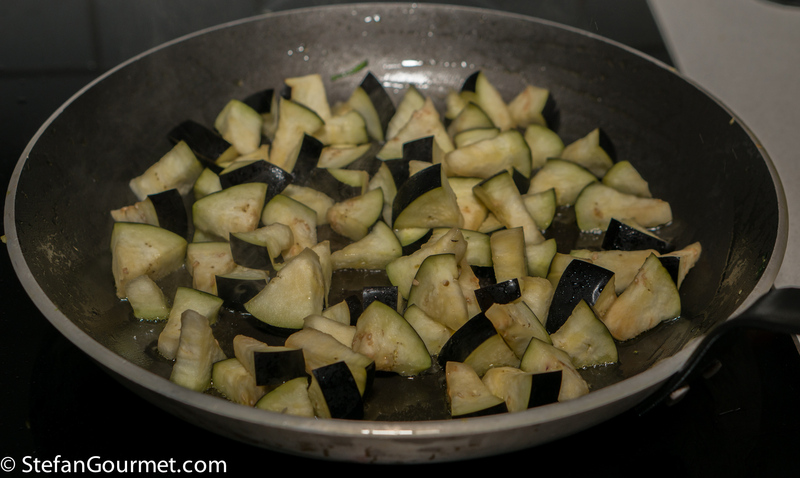 Cook until the eggplant is tender and slightly browned, about 10 minutes. Reduce a litre (4 cups) of fish stock to about 125 ml (1/2 cup). 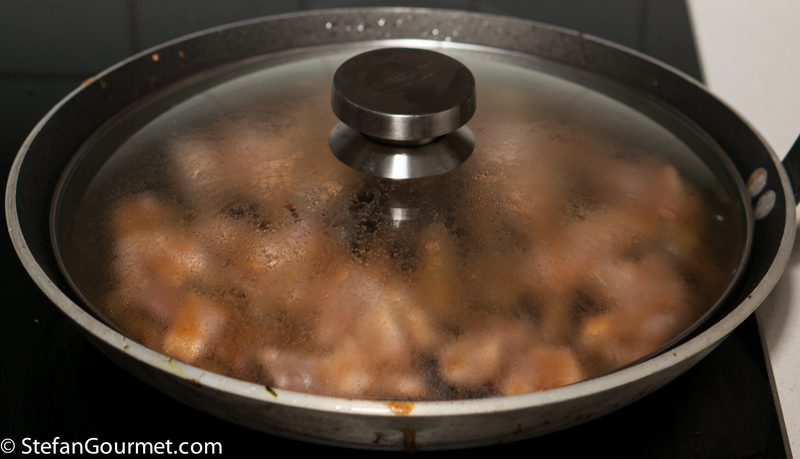 …add a slurry of 1 tablespoon of arrowroot (or cornstarch) mixed well with 2 tablespoons of cold water. Stir over medium heat until the sauce has thickened. 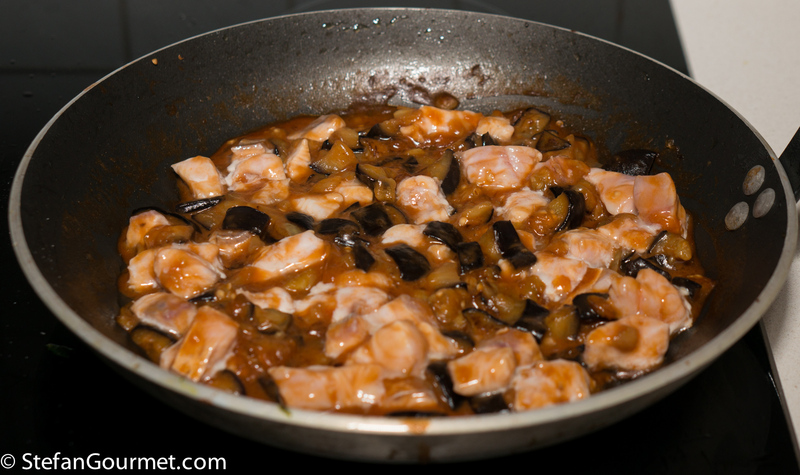 Arrange the fish on top of the sauce in a single layer. Then turn off the heat and cover the pan. The residual heat will cook the fish without overcooking it. After about 5 minutes the fish will be cooked through. 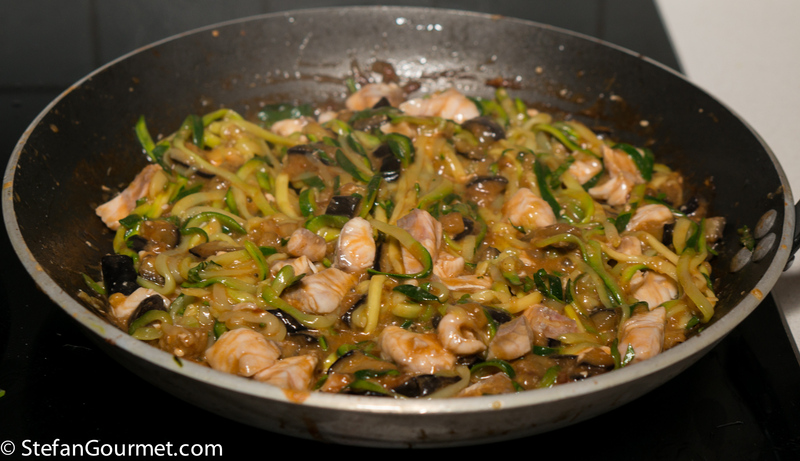 While the fish is cooking in the sauce, heat 2 tablespoons of olive oil in another frying pan and add the zoodles. Stir fry over high heat until the zoodles are warmed through and have lost some of their liquid, about 3 minutes. 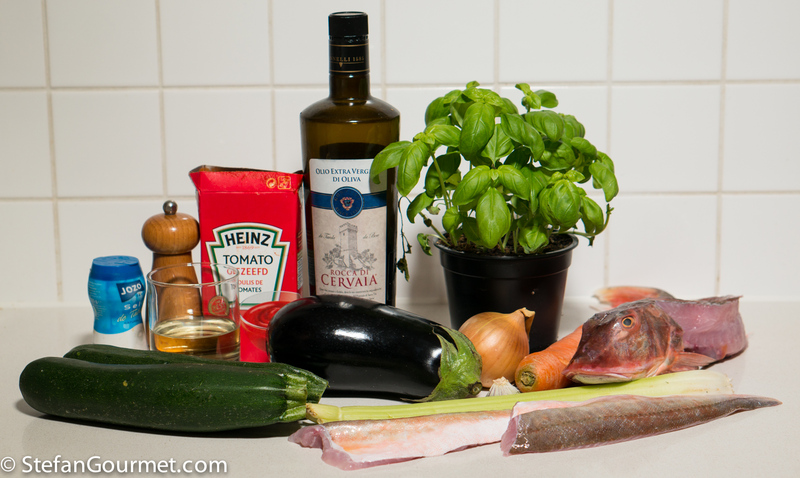 Add the zoodles to the ragù, together with 6 basil leaves cut into small strips. I thought this complex elegant dish would work well with a complex elegant white wine, and I happened to have a nice bottle of Puligny-Montrachet 1er Cru that needed to be drunk as it was from 2007. 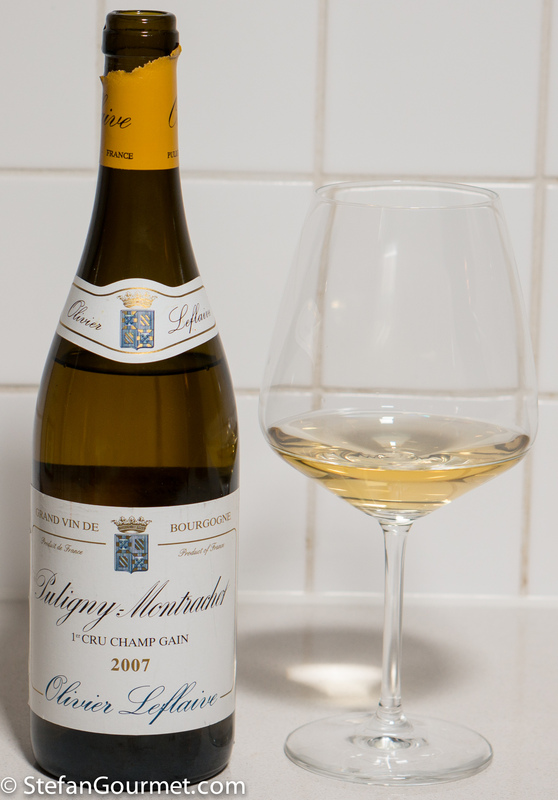 2007 was a cold vintage in Burgundy, so the wine was a bit fresh in comparison with the dish that was dominated by ripe flavors (reduced fish stock, eggplant, basil). The pairing was still okay, ***. To try and improve the pairing, I sprinkled some freshly squeezed lemon juice on the dish, this helped a little, ***1/2. 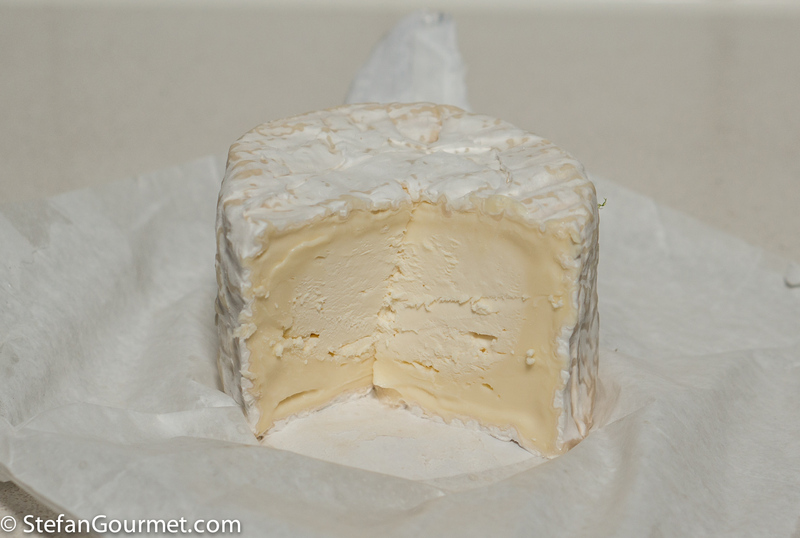 To finish the bottle, we paired it with Chaource, a raw cow’s milk cheese from France that was very nice with it, ****. 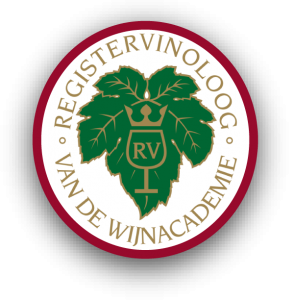 The Chaource should be served at room temperature to bring out the flavor and aromas, but should not be too ripe to go well with the freshness of the wine. 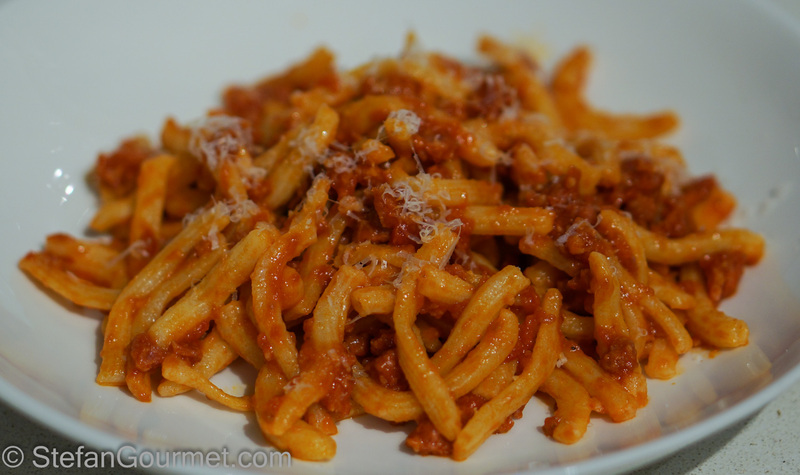 Gramigna al ragù di salsiccia is a classic pasta dish from Bologna. In its basic form the ragù only has three ingredients: sausage, tomatoes, and wine. Gramigna are short hollow tubes of pasta, made with an extruder. It is absolutely delicious in its simplicity. That is yet another gadget I’ve been thinking about getting… I was wondering, how long does it take to reduce the stock from 4 cups to 1/2 cup? 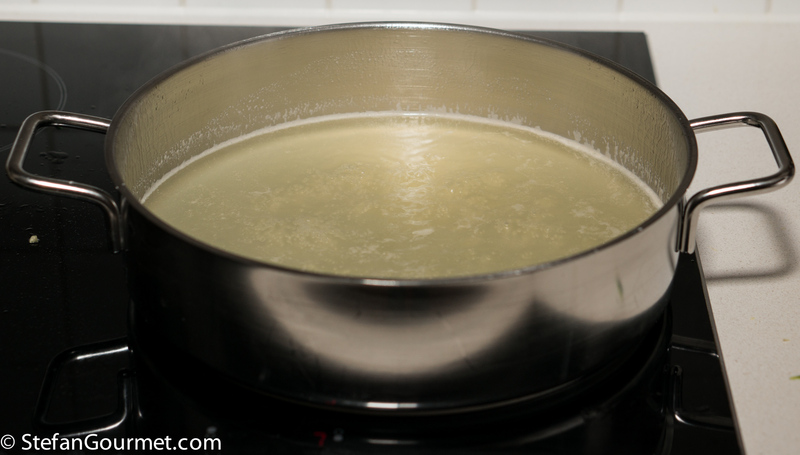 Do you use a high boil or just a simmer? Thanks! I bough the small one, same as Stefan, it’s affordable, practical and a space saver. 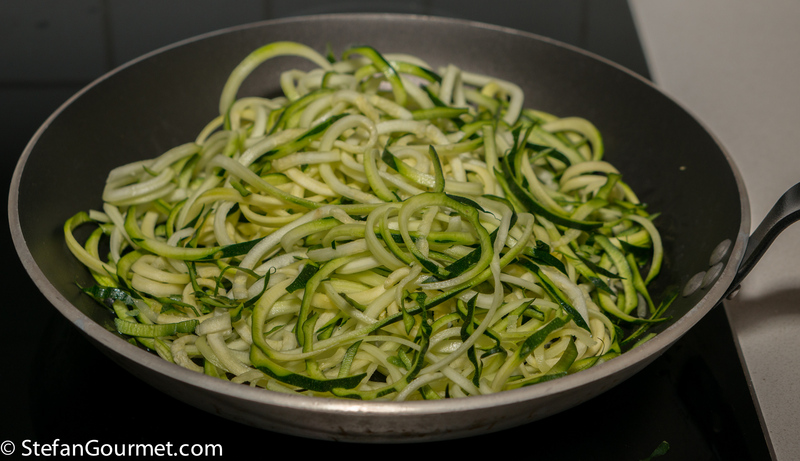 One learns something new every day – Zoodles. 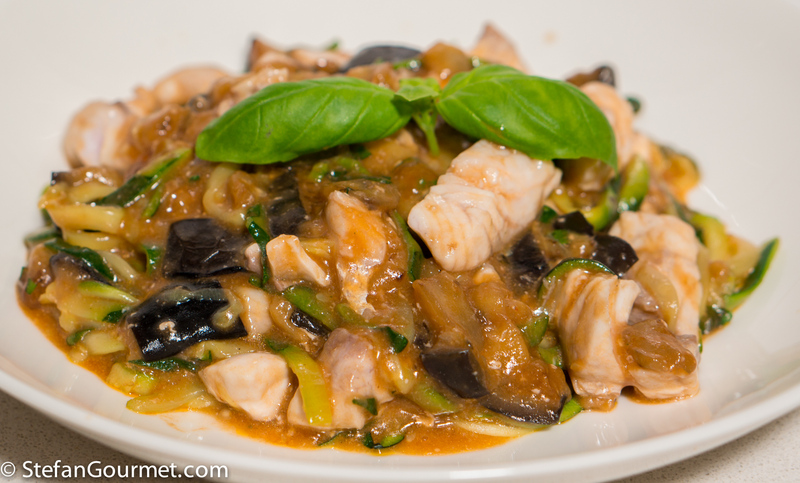 What a great idea dressing eggplant, zucchini noodles, and fish with a ragù, Stefan. 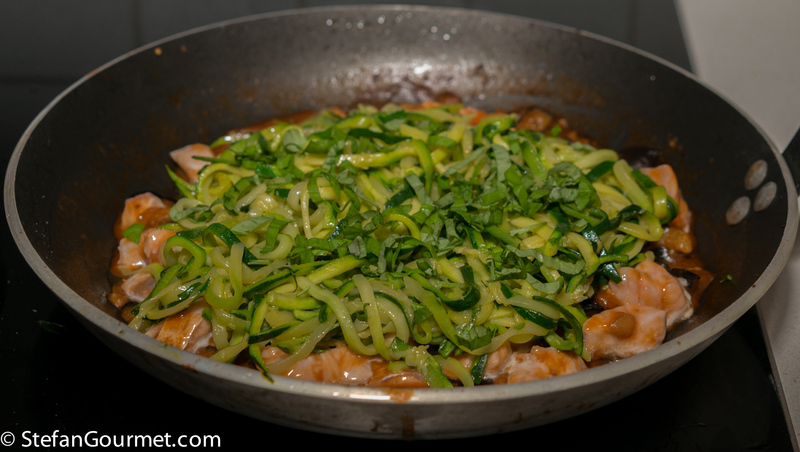 I’m not too big a fan of zucchini noodles, however, finding their texture to be too soft. I guess I’ve been spoilt on al dente pasta for too long. Even so, this dish is definitely worth preparing because of the flavors you’ve brought together. Very nice, I couldn’t imagine to have tagliatelle from zucchini, much lighter.